Survey shows many people need more emergency savings. 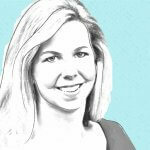 What would happen if you were hit with a financial emergency, big or small? Let’s say your car broke down — would you have the funds to repair it? Or, with hurricane season officially here in the U.S., would you have enough cash on hand to get through a natural disaster? If you’re like most Americans, you would probably have a hard time paying for an unexpected expense. A 2017 GOBankingRates survey found that more than half of adults have less than $1,000 in savings. However, GOBankingRates wanted to find out whether Americans have enough money today to cover future emergencies. So, we surveyed more than 2,000 adults across the U.S. to find out what sort of savings they have to take care of the unexpected. Read on to find out if Americans have enough saved to pay for emergencies. GOBankingRates asked survey respondents whether they have enough saved to cover car repairs, medical emergencies and six months’ worth of living expenses if they lost a job. The findings weren’t encouraging: More than half of Americans still don’t have enough saved to cover common financial emergencies. When it comes to savings to cover expenses in the event of a job loss, 38 percent of respondents have less than $1,000. More than a quarter (27 percent) of respondents actually have $10,000 or more saved. But even that might not be enough to survive a job loss for six months. According to the Bureau of Labor Statistics, annual household spending in the U.S. is $57,311. Based on that amount, the average emergency fund should be $28,656 — enough to cover six months of expenses. Americans have even less set aside for car repairs and medical expenses. Nearly 23 percent of respondents have less than $100 saved for car repairs, and more than half have less than $1,000 saved. However, it’s more troubling that 25 percent of Americans have less than $100 in savings for medical expenses, and nearly half have less than $1,000 saved. Medical expenses are among the emergencies that can bankrupt you if you’re not prepared. Why Aren’t Americans Saving More for Emergencies? 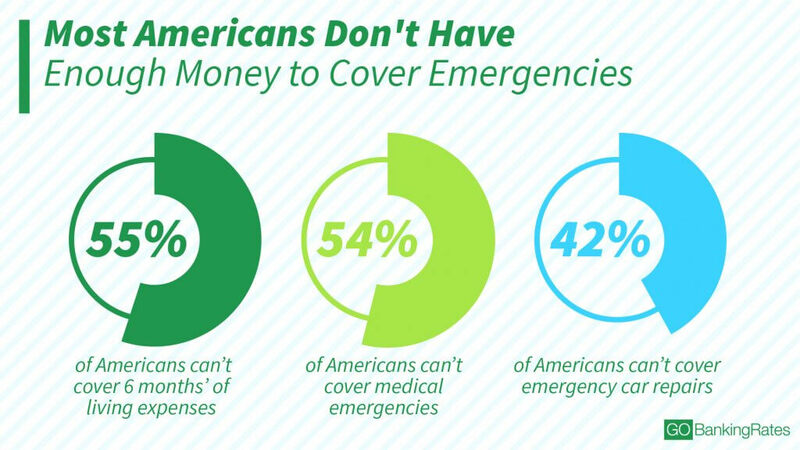 There could be plenty of reasons why Americans aren’t saving more money for emergencies. A GOBankingRates survey found that the most common obstacle to saving is a high cost of living, followed by low salaries. High debt balances also are playing a big role in Americans’ inability to save. The survey findings are even more discouraging when it comes to the savings habits of young adults. 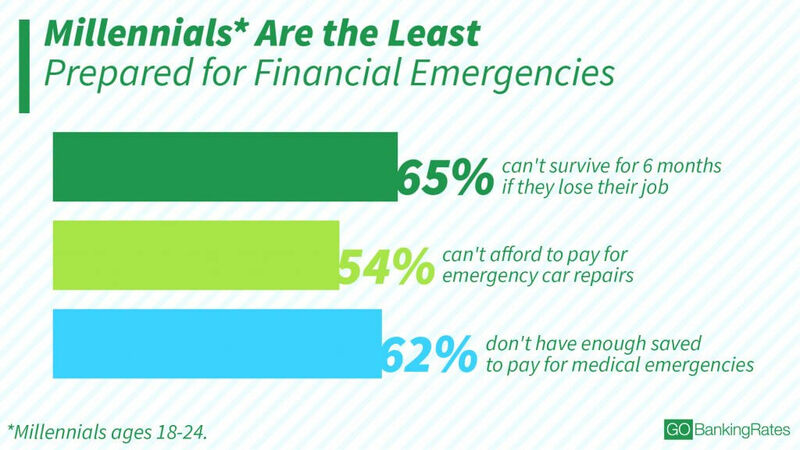 Millennials had the highest percentage of respondents who don’t have enough saved to cover emergencies. Young millennials have the highest percentage of respondents with less than $100 saved to cover living expenses after a job loss, car repairs and medical expenses — 26 percent, 33 percent and 30 percent, respectively. They also have the smallest percentage of respondents with $10,000 or more saved for those three emergencies, followed by older millennials. It’s not too surprising that millennials have less saved than other generations. They haven’t had as much time as older generations to build their savings. Low wages also might play a role. Another GOBankingRates survey found that young millennials are more likely than other generations to say that a low salary was their biggest obstacle to saving. Older millennials, on the other hand, are the most likely to say that debt is the biggest obstacle to saving money. – 61 percent of seniors say they have enough saved to cover six months’ worth of living expenses. – 59 percent of seniors have enough saved to cover medical emergencies. – 69 percent of seniors can cover car repairs. This age group also has the highest percentage of respondents with $10,000 or more saved. Nearly 38 percent have that much saved to cover living expenses in case of a job loss, 20 percent have $10,000 or more saved for car repairs, and 30 percent have that much for medical emergencies. Seniors might be more likely to have an emergency fund because they are less saddled with debt than younger generations. Adults 65 and older have less total debt than every generation except young millennials, GOBankingRates’ 2017 Household Debt survey found. 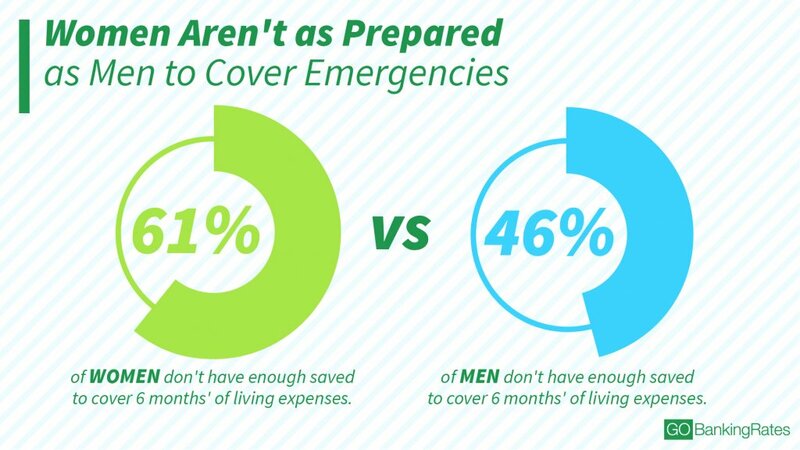 The survey shows that women are much less likely than men to have an emergency fund. About 61 percent of women versus 46 percent of men don’t have enough saved to cover six months’ worth of living expenses in the event of a job loss. Nearly 60 percent of women don’t have enough to cover medical emergencies, compared with 45 percent of men. And 47 percent of women don’t have enough saved for car repairs versus 34 percent of men. Furthermore, 23 percent of women have less than $100 saved for living expenses in case of a job loss, while just 13 percent of men have that little. However, 23 percent of women have $10,000 or more saved. But there’s still a higher percentage of men with that much set aside — 34 percent. These findings are in line with another GOBankingRates survey that found that women are less prepared then men for another recession — in part because of a lack of savings. There could be a variety of reasons why women are less likely to have money saved for emergencies, McClary said. “Among those reasons could be time away from the workplace for maternity leave or other family-related matters, which could interrupt the regular habit of savings deposits that would have been fueled by a steady income,” he said. However, it’s particularly important for women to build an emergency savings fund, said Charles Scott, president of Pelleton Capital Management in Scottsdale, Ariz. The GOBankingRates survey shows that more than half of Americans likely wouldn’t have enough cash to cover common emergencies. As a result, they might rack up debt, have to drain retirement savings or ask friends and family to help pay for unexpected expenses. McClary recommends that your emergency fund size should be equal to at least three to six months of your net income. “That makes it easier to manage everything from unexpected emergency medical expenses to job loss,” he said. If, for example, you earned the median household income of $59,039, your emergency fund amount should be about $15,000 to $30,000 in savings to replace three to six months of income. That’s no small chunk of change, but you can build it up gradually. You’d have to set aside $625 a month for two years to have $15,000 — or $416 a month over three years. But it might not take that long or require such a large deposit each month if you stash any windfalls you get. For example, the average tax refund is nearly $3,000, according to the IRS. Putting that much in an emergency would help create a good financial cushion. If you can only afford to stash, say, $25 or $50 a month in an emergency fund, that’s better than nothing. Just make it a habit by setting up automatic transfers from a checking account to a savings account. And make sure you don’t raid your account for other expenses. Click through to see 39 ways you can save for your emergency fund. Methodology: These findings are the result of a Google Consumer Survey that collected answers from 2,037 respondents from Jan. 11, 2018, to Jan. 13, 2018. The survey asked respondents three questions: 1) If you lost your job, would you have enough money saved to cover 6 months’ of living expenses? 2) Do you have enough money saved to cover emergency car repairs? and 3) Do you have enough money saved for medical emergencies (either for yourself or family members)? Respondents were then asked to identify how much money they have saved for each emergency. This survey has a 4.3 percent margin of error. Your kids will love this easy-to-make DIY.